1. Although the very focus of this comment of mine is on the recent non- substantiated, cynically rhetoric and disingenuous behavior of some fellow individuals and groupings towards the recent heroic steps taken by Arbegnoch Ginbot 7, I do believe that it also reflects how this kind of undesirable part of our political culture requires a real sense of perseverance if we have to make a difference. Those fellow individuals or groupings simply declare that “there should not be any kind of deal with the Eritrean government (Shabia) because it was, and still is, and will remain to be an enemy of Ethiopian national interest.” They do not want to hear why some opposition forces do believe that their relationship with the Eritrean government is not simply based on the principle of ‘there is no permanent enemy or friend in the real world of politics’. To my understanding, they also do believe that as far as the people of the two countries ( Ethiopia and Eritrea) do have a very unique ties in multitude of aspects, it would be necessary to make any effort that should pave the way for the realization of a desired rapprochement. It goes without saying that it is one thing for those individuals or groupings to bring forward their concerns and ideas they believe are important in a critical and rational manner; but it is quite another thing to simply make highly unqualified and declarative rhetoric. Needless to say, this kind of emotion-driven rhetoric does not serve any constructive purpose at all. Politics and society have never been and will never be characterized by static or dormant way of thinking and way of doing things at all. Any entity, be it political or otherwise kills itself if it is not willing and capable enough to adjust itself with the very dynamic world it does belong to. And our own political case we are talking about is not an exception. The political realities of the 1990s and more specifically the beginning of this millennium have their own differences, and there is a compelling reason for us to deal with accordingly. Put simply, it is absolutely desirable for us to engage in a critical, rational, constructive and forward-looking arguments and counter-arguments if we are genuinely serious with the need to bring about a democratic change we desperately aspire. It is from this perspective that I want straight-forwardly be critical of not the concerns and skepticism those individuals and groupings want to express as such. It is rather based on the question of how and why they did choose to do it in a very disingenuous and disruptive manner. I wish this observation of mine could be dead wrong. But I do not think the way they behave towards what they are for or against does show otherwise. The political mentality of undermining and blaming those patriotic Ethiopian opposition political forces (Arbegnoch-Ginbot 7) and a media which is becoming instrumental for advancing the just cause of the people of Ethiopia are fighting for (ESAT) does not serve any other desirable purpose other than contributing to the continuation of the untold sufferings of the people. And the way we have done politics for the last quarter of a century is a very vivid but very unfortunate evidence for the reason why we did fail terribly and repeatedly. The very generalized and back-ward looking premise, “as Shabia (Ato Isaias Afeworki) did terrible wrong doings in the past, it is absolutely wrong to deal with them or with him” may temporarily appeal to emotional state of mind, not critically rational way of thinking at all. Needless to say that the mentality of “I hate what he or she did to me in the past, and it is wrong for me to make any effort towards an appropriate approach or desirable rapprochement” is terribly stupid if we are talking about the need to change things for good. As a matter of fact, blaming the other side (Shabia) for every terrible wrong doing in the political history of our country in general and the case of Eritrea in particular without acknowledging the terrible mistakes made by the ruling elites of Ethiopia (be it the last monarchy, the ruthless military regime, and now an ethno-centric tyranny of TPLF/EPRDF) is terribly absurd, to say the least. Yes, the level of contribution to the political illness we continue to suffer from may vary from one actor to another. Whatever the case might be, we cannot break the very ugly vicious political and socio-economic cycle until we acknowledge the horrible mistakes made by this or that side of political actor and deal with it in an appropriate and forward-looking manner. Agree or disagree, it would be foolish enough for us to simply blame others for what sadly went wrong by pretending that we are immune from doing any painful wrong doings throughout our political history. The moment we try to deceivingly convince ourselves that it is only the other side, not us, that has made all the terrible mistakes and should be responsible; we are not part of the solution but part of the problem. To my observation and understanding, those individuals and groupings who are looking for any disingenuous way of doing things are victims of this kind of irrational and unrealistic mind-set, though an obsession with ulterior personal motives cannot be disregarded. 2. Let me once again make myself very straight-forwardly clear that the very objective of this comment of mine is to express my observation and impression about those fellow Ethiopians who allow themselves to suffer from the political mentality of “if I am not allowed to navigate a political or any other apolitical vehicle the direction and the speed I want to, I will let it down.” Let it also be clear that the very target of my comment has nothing to with simply undermining, or disrespecting or attacking those fellow Ethiopians personally. Absolutely not! I sincerely believe that it is wrong to believe that an individual or a group of individuals should be considered as categorically stupid and nonsensical by their very nature. In other words, it is so irrational, if not nonsensical to base my argument on the premise that individuals or groupings naturally or otherwise are insane because they do terribly stupid things in the course of their lives. It goes without saying that this kind of premise and conclusion is highly vulnerable to a) the making of our arguments and counter-arguments on personalities rather than issues which of course make things worse b) the difficulty to make a constructive effort to help those who intentionally or otherwise engage in a mutually damaging campaign c) the difficulty to those who may try to respond and react to the damage being done appropriately; because there is a temptation to go emotional instead of being critically rational d) the likelihood of leaving the people of Ethiopia in a state of confusion and frustration, and e) repeating the mistakes being made by those individuals and groupings instead of correcting them , and f) the possibility of prolonging the sufferings of the people under an ethno-centric tyranny of TPLF/EPRDF, which essentially does mean staying in a very horrible vicious political cycle we have gone through for a quarter of a century. And that is why I would argue that it is absolutely necessary for us to counter-challenge those individuals or groupings who play a very ugly political twist, not expressing the concerns they may have in a genuine and principled way. Yes, those fellow Ethiopians or Ethiopians by origin who have recently launched kind of conspiratorial rhetoric; and are trying to lecture us that they have come up with a “wonderful idea” of letting down the on-going resolute fight to end the ethno-centric ruthless ruling circle. As this kind of deceivingly wrong rhetoric could help the ruling elites who are trying to maintain their power by taking any desperately ruthless means, it should not be allowed to go on without being seriously challenged. Needless to say, unless we want to be dishonest with ourselves, not to challenge and defeat this conspiratorial move by those few fellow Ethiopians, it would be terribly wrong. We have more than enough experiences that although individuals and certain groupings cannot stop the march for freedom and justice, they could do some sort of damage which may prolong the sufferings of the people under the existing political agenda and practice. That is why I strongly believe that we unequivocally and straight-forwardly have to let them know that the way they are behaving and moving is terribly absurd, and they cannot go with it and cause damages to the on-going struggle for freedom. There is a need to tell them straight-forwardly know that it is the right thing for them to express their views and concerns in a rationally critical and genuinely constructive fashion, not in a very crooked and cynical way. They must unequivocally and strongly be reminded that setting an agenda and launching a campaign which essentially emanate from ulterior personal motives is dead wrong especially at this critical moment in time. They must seriously be reminded that the people of Ethiopia cannot afford to tolerate this kind of making a mockery at those truly patriotic Ethiopians who are left with no any other choice other than launching all-inclusive means of struggle if the brutal ruling circle should be defeated and a change we strongly aspire should become a reality. Do not get me wrong that what I am saying is that there is no need to criticize the weaknesses of those freedom fighters. Absolutely not! What I am saying is that there is a need to do it in a genuine and problem-solving manner, not in a disingenuous and problem – mongering mind- set that emanate from an obsession of personal ambitions or interests. It must, on the other side, be underscored that those Ethiopians who might legitimately be outraged by the very disingenuous behavior of those individuals or groupings need to make their counter- challenges in a critical, rational, civilized, constructive, forward-looking and decisive manner. If those fellow individuals or groupings are courageous enough to slow down the very undesirable move they have chosen and show the concern they have in such a way that it could advance the on-going struggle for freedom and justice, it must be taken as a patriotic courage in the real sense of the term. And I want to believe that some of them, if not all would be willing and able to do so. But, it must once again unequivocally be clear that the people of Ethiopia in general and genuinely concerned Ethiopian diasporas in particular are extremely tired of the political mentality of turning things around whenever we feel that our excessive personal egos are challenged. I am saying this because from what I have tried to closely follow this very cynical move, I have to say that it is the reflection of ulterior personal motives that manifested themselves whenever individuals get frustrated with their failures to realize those ulterior personal motives. To be specific, those motives do emanate from the very voracious or excessive personal ambition, excessive desire for self-importance in any societal activities (be it political, social, communication, etc.). Wherever it may come from and whoever hosts it, disingenuous or hypocritical behavior has been, still is, and continues to be one of the main reasons for not to succeed in bringing about the desirable political change the people of Ethiopia desperately aspire. It is self-evidently clear that it is this kind of behavior that significantly helps the tyranny of an ethno-centric politics to perpetuate itself. Needless to say, as it is not realistic to avoid this part of being human, the only thing we can do is deal with it appropriately and control it before it kills not only others but also its hosts themselves. Yes, we have to deal with it wisely but decisively. Yes, those fellow Ethiopians who are involved in an emotional, irrational, and notoriously disruptive campaign against those who are doing their best to the extent of paying ultimate sacrifices (Arbegnoch –Ginbot 7), and a media (ESAT) that is making great efforts to keep the people of Ethiopia well-informed about the objective reality in all aspects of lives should be told to get out of the ugly game they are muddling in. I would strongly argue that the people of Ethiopia cannot afford to ignore this kind of outrageously disingenuous behavior any more. Let it be crystal clear that the patience or tolerance of the people towards the very notorious political disease of not only being unhappy with the successes of others but also working hard to see the efforts being made by others failed is a serious illness that must be treated accordingly. This does not mean that destroying the host together with the disease (disingenuous and cynical state of mind) is either an acceptable or a desirable thing. Absolutely not! It rather does mean that those fellow Ethiopians who intentionally or otherwise have become victims of terribly wrong behavior must be told that they need to get out of people’s way. This is because we are talking about the disease that we have both at a personal and a group level; and if it is not treated timely and appropriately, it keeps making more messes and damages. What we are talking about is a disease that can cause a painful infection to those who firmly stand with unity of purpose at this critical moment of the struggle for freedom and justice. I sincerely believe that there is a desperate need for us both at the level of individual and various groupings to engage those fellow Ethiopians in a rationally constructive conversation and help them get out of the terrible way of doing things they found them themselves in. Well, I am aware that the question of whether those compatriots would be courageous enough to abandon their disingenuous, hypocritical and conspiratorial way of doing things and engage in rational and constructive argument is not an easy task. But, I want to believe that as any human being who is always vulnerable to the gravity of wrong doings, those compatriots would be in a position to admit what went wrong with them and retake the right direction in which we should march for the realization of a democratic society we strongly aspire. Needless to say, the idea of totally avoiding or preventing wrong doings including the ones with serious consequences is unrealistic. What we can do is stay vigilant and try to prevent what is preventable and mange what is manageable whenever crises happen. I am not trying to exaggerate the move by those fellow Ethiopians as such. What I am trying to point out is that if we agree that this kind of behavior of individuals or groupings could have significant contribution to the non-existence of the practices of democratic principles and values in our political history, it is simply wrong to ignore them. 3. Let me make what I am trying to say more specific and concrete. As one of millions of genuinely concerned Ethiopians, I do closely follow what is happening and who is saying what and who is doing what with regard to the struggle for freedom and justice that is changing itself in a very dynamic way. Needless to say, staying well-informed is something essentially instrumental to respond to the situation accordingly. The responses we may come up with necessarily depend on the willingness, open-mindedness, courage and ability to look at things critically, objectively and constructively. If we do base our responses on the very process of objective perception and understanding, the possibility of playing positive and constructive role will be remarkably high. If we, on the other hand, do base our perception and understanding simply on our own perspective of subjectivity and personal interests, the possibility of engaging ourselves in disingenuous and unconstructive way of doing things will terribly get high. To reiterate what I said earlier, it is this kind of very unfortunate political culture and behavior that has made the realization of democratic society painfully difficult throughout our political history. And what is extremely worrisome is that there are still considerable number of individuals and groupings which continued dealing with the politics of this 21st century with the same old way of doing politics. Believing that as long as it does not aimed at mere name calling and personal attack, I want to be as straight-forward as possible. Let me point out some of the specific cases which clearly shows why I am saying disingenuous motives. A) I curiously listened to what some fellow individuals had recently to say over and over again on Addis Dimts Radio. I seriously but not surprisingly observed how Abebe Belew of Addis Dimts had to struggle hard to present himself both as a host, as “spokesperson” and as a “coordinator” of individuals whose arguments against those patriotic Ethiopians and their relationship with the Eritrean government sound highly generalized , emotion-driven and of course terribly clumsy. I sincerely believe that arguing for or against any point of view is quite desirable and the right thing to do let alone the points of view that has a lot to do with national politics and interest. But, simple and highly generalized rhetoric such as “those who make any contact and deal with the ruling party of Eritrea should be considered as traitors because Shabia was our enemy, still is, and it will continue to be” is something which badly overshadows the power of rational and realistic way of argument as far as the dynamic nature of politics we should deal with is concerned. I want to believe that Abebe Belew deserves due recognition and appreciation for bringing very important and timely political and socio-economic issues forward on his radio programs, and let both professional and ordinary Ethiopians have their views and analyses for the last several years. His relentless effort particularly since the 2005 tragic elections has been truly appreciable. However, I want to say that what he has done well in the past cannot be an excuse for what he recently has turned round. As I have attentively tried to follow, this turn round has manifested itself during and after the trip by ESAT’s journalists to Eritrea and the broadcast of the entire interview with Ato Isais Afeworki. This turn round got uglier following the news that Arbegnoch Ginbot 7 launched its attack on various military targets of the ethno-centric ruling circle (June 25, 2015). How it got uglier? Abebe Belew, intentionally or otherwise joined those fellow individuals who chose to create a state of confusion about what truly patriotic and heroic Ethiopians are doing. I carefully and repeatedly listened to how Abebe Belew of Addis Dimits (7/12/15) has tried to twist things when he was asked by one of his listeners with regard to the formation of some kind of organization he was talking about; and why he tried to be carefully selective when he was talking about the news on the recently launched attack by Arbegnoch Ginobt 7 on military forces of TPLF. As I have tried to carefully listen to what Abebe was talking about, it was a) about the effort being made to form forums in each state which would gradually come together and form a kind of nation- wide form b) the effort being made to form a kind of journalists’ association that protects their rights (I am not sure who is violating their rights in the real sense of the team). Oddly enough, instead of answering and responding to a comment and question forwarded by the caller in such a way that he could make his idea clear, not necessarily agreeable, he couldn’t control his emotion and nervousness, and as the result, he messed up the conversation with expressions which badly undermined his approach as a personality of radio show. He started his response by saying “You did not understand and you need to come back from the wrong way yo happened to be.” And he repeatedly said, “do not mix water and oil; you have got confusion, etc.” as if he was not talking about the formation of ‘large and viable coalition and association, and an entity that protects the rights of journalist in the diaspora.” Anyone can go back to that program and carefully listen to what Abebe was talking about and what the listener was trying to get a clear sense of understanding. I do not know how the idea of doing big things could be meaningfully feasible with this kind undesirable approach and sentiment. The way how Abebe tried to respond to the question of why he was selective when he talked about the recent steps taken by Arbrgnoch Ginbot 7 was really with some kind of silliness. He tried to justify his response by saying that he did not listen to the audio of which TPLF declared “thirty messengers of Shabia were killed and their terror act has been destroyed.” He very cynically added that Addis Dimts does not broadcast or present news without sufficiently credible information or something which is confusing or something of which it’s right and left is not clear.” I hate to say but I have to say that this is stupidly disingenuous. Well, he might not want to believe the breaking news by ESAT for the reason he did not want to say it. But, it is terribly cynical to try to not tell the news that was proved to be true by the ruling party itself. Needless to say, this mentality of “I do not want to believe something brought by a person or an institution that I am not in good terms” is not something the Ethiopian people deserve at this critical moment at all. B) I have carefully and repeatedly tried to read articles and comments by some of those individuals (Ato Andualem Tefera, Ato Demis Belete,). I listened with some degree of outrage but with patience to what Ato Elisas Kifle had to say on civility paltalk (the very concept of civility is terribly abused here). When he was asked to briefly talk about the steps taken by Arbegnoch Ginbot 7, he sounded just like one of the propagandists of TPLF/EPRDF. Although I do not know he did it intentionally or as a slip of tongue, he told one big truth. He informed us that individuals such as Himself, Abebe Belew, Teklemikael Abebe, Ato Kinfu Asefa and Professor A. G/Mariam who were the founding members of ESAT had been pushed out, and those who are tools of Ginbot 7 and by implication Shabia got a full control of it. He did not objectively explained the big question why they were pushed out if they were at all? It is with this kinds of individuals of disingenuous and cynical behavior that the very ugly campaign we are witnessing is being orchestrated and being carried out. 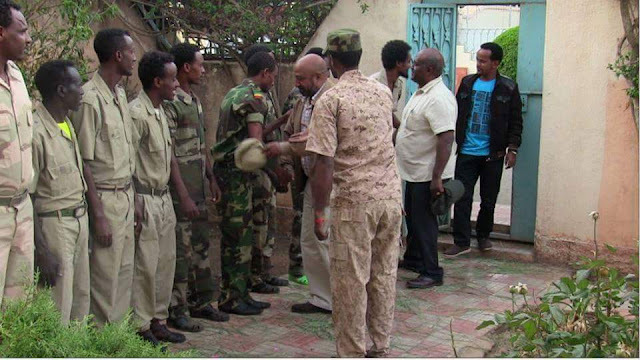 C) Although he looks having difficulties to be courageous enough to get out of the mess those individuals continue to muddle in, Kinfu Asefa’s recent comment with regard to Professor Berhanu Nega’s remarkably heroic decision to go to Eritrea and join freedom fighters as their leader is truly appreciable. He still questions the trustworthiness of Shabia which I believe is not something to be disregarded as long as we agree that it has to be approached and dealt with rationally, realistically, cautiously and of course in a genuinely forward-looking manner. Concerning the question of whether Arbegnoch –Ginbot 7 should be supported or not, it is better to leave it to the people who are desperately looking for a leadership that is willing and able to lead them to the realization of the freedom and justice they strongly aspire. Let me conclude by saying that it would be devastating for us to turn round, and behave disingenuously and disruptively whenever and wherever we feel that our excessive personal egos are challenged. I am not naïve enough that controlling our personal importance and ambitions as parts of our human nature is as simple as anything to deal with. But, I strongly believe that we can and we should use our reasoning power together with our real sense of courage for the sake bringing about the desired political and socio-economic system in which we could live with peace, integrity, mutual respect and shared prosperity.